Today’s crafty creations is a necklace that I found on LimaBeads. 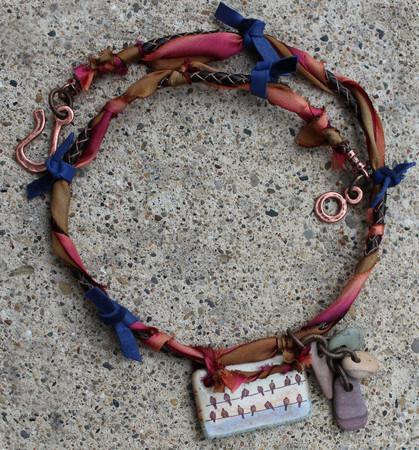 It is a ceramic pendant “Birds on a Wire” on colorful hand dyed silk ribbon. The ribbon is randomly knotted, small beach stone pebbles dangle on one side of the pendant. The clasp is a antique copper hook and eye. I’ve really gotten to where I love the jewelry made with silk ribbon, and I want to try adding it in some of my designs. My problem is when I go looking for some silk ribbon I can never find any that I like. If anyone has any ideas where I can look please let me know. Back to the first series of Crafty Creations.